It might be a small thing, it might be trivial and not even noticed by many of the millions of light entertainment viewers and sport fanatics around the world. But I observed three small images that made disturbing viewing for their sentiment. All three are within the context of the celebration of man’s / woman’s ability to entertain and strive for athletic and graceful perfection. 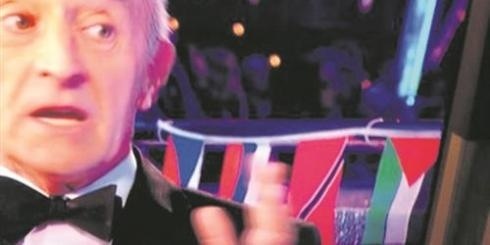 Strictly Come Dancing, the doyen of the BBC’s weekend evening light entertainment schedule, is a programme which my wife and many of my friends are gripped by. On the menu last Saturday was the fantastically themed concept of “dance from around the world”. Behind one of the judges, Len, were flags from all the countries. Every one of the states were draped behind the judges, with one odd addition. A Palestinian flag. Curiously, there were no other unofficial states. I wrote to the BBC to ask if the precedent they had set would be continued using other unofficial state flags such as Islamic State? After all they are an unofficial state, just like Palestine. I now eagerly await a reply. And just to advise, when complaining through the BBC’s circuitous web complaint form, don’t hold your breath for a response. They are never quick and often you have to pursue them. Next to Qatar. Qatar has become a centre for athletic excellence. Despite having almost no history in any form of athletic endeavour, this tiny state will host the World Athletics Championships, the Top World Tennis Tournament outside the big four majors, an annual World Golf Open and most notably the 2022 Football World Cup. On top of that, it is currently hosting the World Swimming Championships. Israel has had a notable success at the swimming championships, a Gold Medal for the Israeli Guy Marcos Barnea. 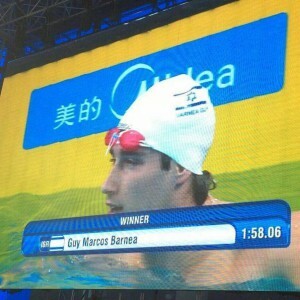 The Qatari broadcast of the Championships put a banner up on the screen with a curious omission. The Winner, the winner’s name, the winner’s time, the winner’s 3 letter abbreviated country name were all up there. But next to that a new and unrecognised flag. A white flag, with two blue horizontal bands, one near the top and one near the bottom of the flag. Nothing else. Of course, missing was a blue Star of David. Although this is not without precedent. 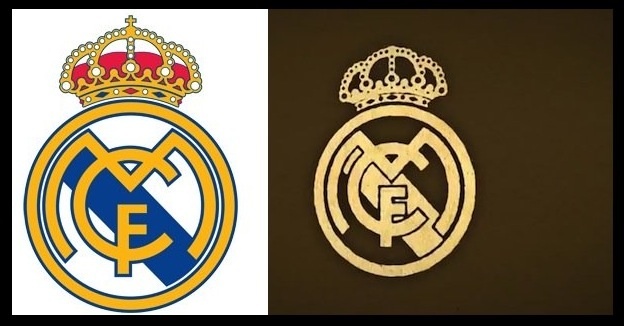 In the third example of misappropriated references, Real Madrid‘s new UAE sponsors removed the Christian Cross from the top of their club crest. The Spanish (pro Madrid) newspaper, Marca, advised that the club removed it from their logo on the new £1bn Real Madrid Resort’s promotional materials (based resort in the UAE). Marca describes the change as a means “to avoid any confusion or misinterpretation” in relation to a project being built in a largely Muslim region. The cross in question is part of the Royal Family crest relating to the crown worn by the head of state (who’s name is part of the club of course, Real = Royal). Next for Real Madrid’s misinterpretation avoidance department? Well maybe replacing the “MCF” in the centre of the crest with a picture of the club president hugging a spouting oil derrick. It will be intriguing to know, at the 2022 World Cup, whether there are plans to remove other country’s religious references. With that in mind, should we now expect the England flag to be a plain white flag with the removal of the Cross of Saint George. The idea of a “white flag” and England’s football team might be too obvious. But what about a Swiss Flag without a Cross, it is just a Red Flag. That would be like a red rag to a Swiss bull. The FIFA executives in Zurich may feel like this is a price worth paying though (and usually FIFA has no shame in considering the price of World Football’s soul). Either way, these flags of convenience are a troubling trend. It smacks of eradicating other cultures and histories. In the case of the cross atop of the Real Madrid emblem, it is clearly a case of selling the soul of the football club. In the case of the missing Star of David it is denial of history and existence. And in the case of the BBC, well, it’s just the good ol’ Beeb showing its true colours. This entry was posted in Uncategorized and tagged BBC, Israel, Palestine, Qatar, UAE on December 8, 2014 by admin.